During Christmas season, the popular cake/ bread that is ordered from bakeries in Sri Lanka is the breuder. This is a speciality of the Burgher cuisine of Sri Lanka. I had been trying for some time to find someone to contribute a home-made recipe of this delicious bread. I was delighted to finally come across another blogger and invited him to share his family recipe on this blog as well. Here is the guest post of Paul van Reyk, from My Buth Kuddeh food site, with his introduction to his family tradition of baking breuder and his recipe. Wishing you all a merry Christmas! No Christmas at our house in Sri Lanka was complete without my grandmother’s breuder. It’s basically a cakey bread, based on a yeasted dough but with the sweetness of a sponge cake, related to Italian pannetone. It’s a direct entry into Sri Lanka cuisine via the Dutch Broodtulband named for the fluted ‘turban’ shaped mould used to make it. Further embedding the Dutch connection, brueder is traditionally eaten in Sri Lankan Burgher households in slices covered in butter and topped with a thick slice of Edam cheese. There is something very festive about that red waxy ball which sliced open reveals a pale European sun yellow cheese. Making the breuder, I am transported back to the kitchen of my childhood, watching my grandmother knead the dough, having the thrill of buttering the mould and pressing sultanas against the sides anxious that they stay in place, full of expectation as it was taken to my uncles house across the road as we didn’t have an oven, and then the excitement of un-moulding this magical transformation of so few ingredients hoping desperately that it comes away cleanly. The smile on grannie’s face when it does was more rewarding almost than the first bite into its soft, crumby heart. Make the dough the night before. Take as much yeast as is recommended for your particular yeast for making bread with 500 gms of flour (it can vary so read the packet or ask when you buy it), add the yeast and the sugar to a little hot water to get the yeast started. It will froth slightly. When it’s bubbling happily, add this to the flour and mix in well. Now slowly add water and keep mixing until you have a lump of dough that lifts easily out of the bowl or off the board. Knead it for 10 minutes or so. Put it in a bowl, cover the bowl with a damp tea-towel and leave it in a warm place to rise overnight. The next day, take the dough and add to it the butter, egg yolks and sugar. Add the first three yolks separately and mix in well each time. Then add the others also one at a time alternating with dollops of the caster sugar till it is all used up. What you will have now is a very thick wet doughy batter. Butter a turban mould. Put a good sprinkle of whatever dried fruit you are using on the bottom. Squish some dried fruit against the sides of the mould, too. Pour in the batter. Sprinkle more of the dried fruit on top of the batter. If you like, and I do, you can mix some dried fruits into the batter, too. Leave this in a warm place, the mould covered with a damp cloth, for 1 or 2 hours until it rises again (it won’t rise as much as the dough did overnight). Meanwhile, pre-heat your oven to very hot – around 220C. When the dough has risen the second time, put the mould in the oven and bake for 30 minutes. Check at that stage that the breuder is cooked by poking a bamboo skewer or similar into the dough. If it comes out clean, your breuder is ready. If it doesn’t, give the breuder 10 – 15 minutes more. Tip: Putting some baking/greaseproof/brown paper on the top will reduce the likelihood of the dried fruit burning. When it’s cooked, take it out of the oven and leave it to cool in the mould. You should then be able to give the mould a good thump and have the brooder come cleanly out of it. Resist all temptation to ice or otherwise muck around with the breuder! Just slice it up and have some butter and Edam or cheddar cheese to have it with. But you are allowed to make summer pudding with the left over breuder if you like, or indeed any of those bread pudding dishes. Today’s recipe is another of my baking experiments. My favourite aspect of cooking is baking. Ever since I tried out Kitchen Cici’s delicious rosemary cheese bread, I have started experimenting with breads. I had originally intended to make pineapple muffins but I guess people at home were kind of tired of my weekly experimental muffins so I decided to switch to bread which I also enjoy making. I adapted Jamie Oliver’s basic bread recipe to include pineapple and cloves. It turned out great so I am sharing it here at the Fiesta Friday. I will not be posting as much over the next twelve months as I did the previous year mainly because I will be away from home. However, I do have some recipes that I am yet to transcribe and post so will try to share at least one each month. The music feature today is on raï. The first clip is an excerpt of a concert (1990) by Chaba Fadela and Cheb Sahraoui. The next clip is a recent release of Cheb Khaled, whose song Didi was my introduction to raï music. Hope you enjoy the music and this delicious bread! Take a ¼ cup of the water and add the yeast, 1 tablespoon of sugar and pinch of salt. Let the yeast mix rest for about 5 – 10 mins and turn frothy. Sift the flour into a mixing bowl and stir in ½ tsp of ground cloves. Add the yeast mix to the flour and mix. Gradually add the remaining water little at a time till the flour-yeast mix becomes a soft dough that is not sticky. Knead the dough for at least 5 mins. Transfer the dough to a lightly greased bowl and cover. Let the dough rest for about 30 mins or till it has doubled. Add the pineapple puree and the remaining sugar to a saucepan and warm it over low heat for couple of mins (At this point, I also added a pinch of cloves but my mother feels that it is better not to add the cloves to the pineapple puree but rather directly to the dough). Do not over-heat or cook the pineapple as it will take away its taste. Remove from heat and let it cool. When the dough has risen, transfer it to a floured surface and punch it down (I like this part). Roll out the dough and spread the sweetened pineapple puree over the surface. Roll in the dough starting from one end. Transfer the rolled dough with filling into the lightly greased baking tray and form the shape you want it to be (I like circular loaves). Brush the surface with warm sugar syrup. Bake the bread at 170⁰C for around 30 mins. The time will vary according to your oven. Let it cool for at least 15 mins before slicing and serving with some margarine. In my mother’s kottu series, I am including one of her dishes she calls the ‘bread kottu.’ Home-baked bread, when leftover the next day or two, never tastes as good as it does fresh. So, when we do end up with a few slices of such bread, my mother makes this kottu dish. I am sharing this at the Virtual Vegan Linky Potluck #8 as well as bringing a second kottu dish late to Fiesta Friday #29. I received an interesting email a couple of days ago from Ellie Priestman, a researcher at Studio Lambert. After reading the email, I agreed to share the gist of it here on my blog. According to Ellie, Studio Lambert is an independent television production company based in London and “have produced a number of observational documentary and factual entertainment series including Undercover Boss, The Great Interior Design Challenge and the BAFTA award winning series Gogglebox. (More information about the company can be found at www.studiolambert.com).” They are currently planning a production for BBC2 and are “looking for lively and outgoing couples and families who will be happy to show us what happens in their kitchens and around their dinner tables. The series will very much be a celebration of food and family – so we’re looking for people who are passionate about cooking (and eating!) together.” So, if anyone reading this and living in the UK is interested, please get in touch with Ellie via email: getintouch@studiolambert.com or phone on 0203 040 6875. For today’s music as part of the A.R.Rahman series, I decided to select a few of his collaborative work with other international musicians to share here. The first song is an excerpt from the self-titled album SuperHeavy (2011) of the five member group of Mick Jagger, Dave Stewart, A.R.Rahman, Damian Marley and Joss Stone. The second song is a collaborative work with Persian American music group, Niyaz, from their album Sumud (2012). This song is their interpretation of an Afghan folk song. The last song for today is an interesting one from MTV’s Coke Studio (2013), fusing Buddhist chants with traditional Arabic tunes and Indian music. A fan of Ani Choying, I love it the way she calmly sits in the midst of all the sounds breaking out wildly around her and continues her chant. Hope you enjoyed the collaborative music of A.R.Rahman and the other musicians today as much as I did! Let me know if you try out this bread kottu recipe. Make the sauce first by cooking the tamarind juice, coconut milk, curry powder and salt to taste for about five minutes till the gravy thickens. Remove from heat and keep aside. Heat the oil in a pan and add the vegetables and stir fry for a couple of minutes. Season with turmeric powder, pepper and salt. Add the chopped bread to the pan and continue to stir-fry. Just before removing from heat, add the sauce to the pan and mix well. Sprinkle with coriander leaves and serve warm. May this special day of Wesak, which celebrates the day of birth, enlightenment and death of Buddha, bring you peace! 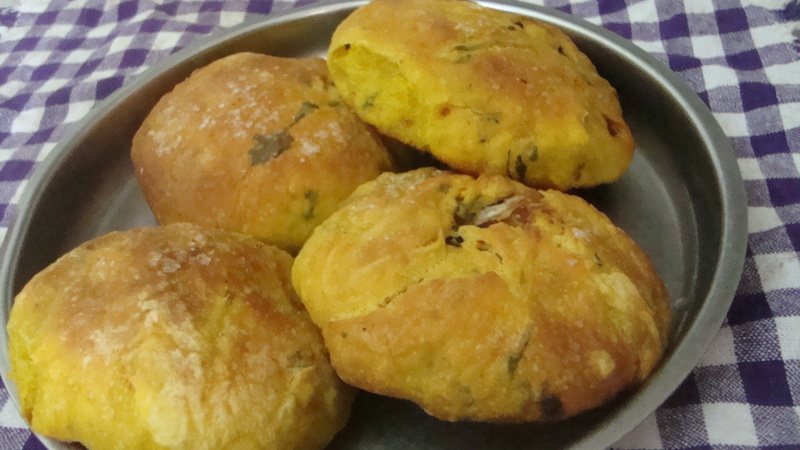 I am sharing this post on Angie’s challenge for this month with my recipe for turmeric coriander bread filled with seeni sambol. Ever since I started baking last year, I have found that I enjoy baking different types of bread. One of my favourite and successful breads is rosemary olive oil bread (recipe source: Jessie@A Hint of Honey). Using her recipe as a base, I have sometimes played around with herbs to make different versions of the bread and today, I would like to share my Sri Lankan twist to this bread. Stir in 1 tbsp sugar and 2 tsp yeast in 1 cup of warm water in a mixing bowl and let it sit for about 10 mins till it becomes frothy. Add a cup of flour to the yeast mixture and add the salt, turmeric, pepper, chopped coriander or powder to the mixing bowl. Mix well before adding the sesame oil and add the remaining flour ¼ cup at a time till the dough is formed. Knead for a few minutes till it is smooth. Lightly dab the mixing bowl with a little oil and cover, leaving the dough to rise for about an hour. Transfer the dough to a floured surface and roll out the dough. Spread the seeni sambol mixture over the surface. Starting from one end, roll the dough into a log. You could leave the dough as a log or connect the ends to make a round bread or cut into 8 equal pieces. If you cut into 8 pieces, make each piece into a ball ensuring that the ends are closed and that the filling is not seeping out of the dough. Transfer the dough to a lightly greased baking tray. Cover and refrigerate till about 30 minutes before you plan to bake. Leave the tray out in the kitchen for about 30 minutes before brushing the bread with either a little melted margarine or dissolved sugar. Bake the bread at 175⁰C/340⁰F for 20 mins. Check at intervals as the baking time differs depending on the oven. Serve warm with a nice vegetable soup. Sandwiches are another globally popular and much consumed food. Everyone is sure to have their own recipe for what they like in their sandwich. The second recipe I wish to share today is a sandwich that is commonly served at kids birthday parties, tea parties and even cocktail events in Sri Lanka. While there might be slightly different ways on how this party snack is made in the country, I am sharing here the way my mother makes them. Boil or steam carrot and beetroot slices. Grate separately and add 1 tsp finely chopped onion, ½ tsp margarine and salt and pepper to taste to the two vegetables. Keep aside. Crush or coarsely grind the boiled green peas or mint with the green chilli and 1 tsp finely chopped onion. Add ½ tsp margarine with salt and pepper to taste and mix well. Make the sandwich by layering each slice of sandwich bread with one of the vegetables mixtures, starting with the carrot mixture on the first layer, the beetroot mixture on the second and the mint or green peas mixture on the third. 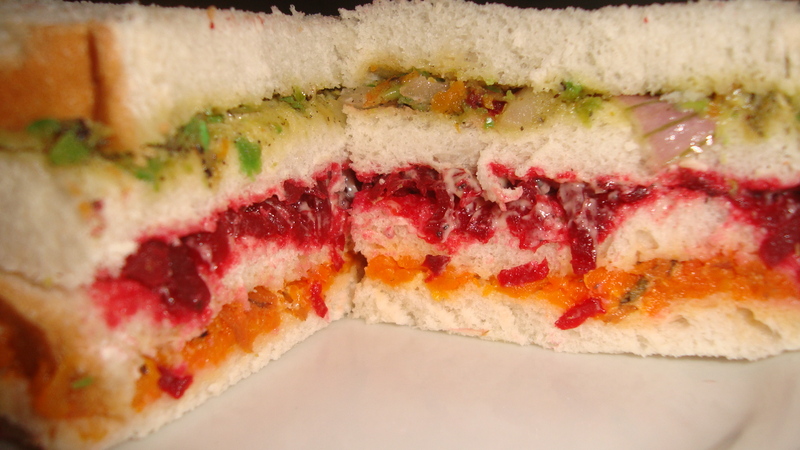 Cut off the edges and cut the sandwich into two or four triple layer, colourful sandwiches. Serve with hot Sri Lankan tea or fresh fruit juice.